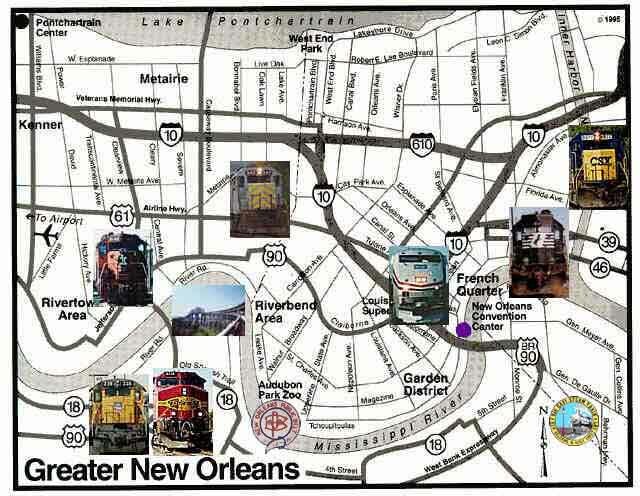 The New Orleans section is quite extensive and covers the seven major railroads that operate in New Orleans, as well as a seperate section on the "Huey P. Long" bridge, the longest railroad bridge in the world, the New Orleans Public Belt railroad, and the New Orleans & Gulf Coast railroad. Just click on the railroad engine nose or emblem to go to that part of town to check out what you might find there. The engines or emblems on the map are in the approximate location that you will find each of the railroads. Also provided is a brief description for each railroad as to their location on each applicable page. Be careful and enjoy your visit.